What types of online media does SentiOne monitor? SentiOne monitors all kinds of statements, comments, and articles posted publicly all over the internet and private messages for authorised accounts. Our monitoring covers millions of sources: social networks (like Facebook, Instagram, Twitter, Google+, YouTube, Foursquare, and many more), blogs, forums and online portals. How does SentiOne monitor the internet? Depending on the source, SentiOne monitoring is based on crawlers or publicly available APIs. Our proprietary system gathers only publicly available data obtained in legitimate way. 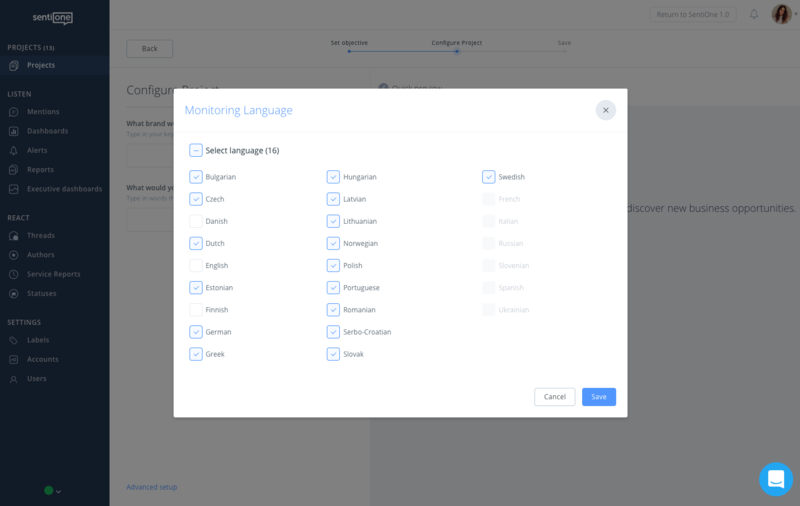 What languages does SentiOne monitor? SentiOne monitors the internet contents in 27 languages. (Polish (pl), German (de, de-at, de-ch), Russian (ru), Ukrainian (uk), English (en, en-gb, en-ie), Dutch (nl, nl-be), French (fr, fr-be, fr-ch), Slovene (sl), Bulgarian (bg), Czech (cs), Slovak (sk), Danish (da), Greek (el), Finnish (fi), Hungarian (hu), Swedish (sv), Norwegian (no), Romanian (ro), Latvian (lv), Lithuanian (lt), Serbian (sh, sr), Croatian (hr, sh), Bosnian (bs), Montenegrin (me), Italian (it, it-ch), Spanish (es-es, es,), Portuguese (pt-pt, pt). It is possible to set up queries to analyse mentions from specific markets. We are constantly expanding our coverage for new languages. How does SentiOne calculate the sentiment? Our sentiment analysis is based on research work by John R. Crawford and Julie D. Henry. They analyzed the Positive and Negative Affect Schedule (PANAS). Based on their research, we have created algorithms that help us determine the emotional attitude of the author to discussed subject. The Positive and Negative Affect is used to study the frequency and intensity of the experience of positive and negative affective states, which constitute one of the basic components of happiness and subjective well-being. Negative people see the world in darker colors. NA and PA scales reflect aspects of the disposition of a subject. High NA points to the subjective anguish and unpleasant obligation, and low NA to lack of experience. In contrast, PA shows when a person experiences a pleasant engagement with the environment. Thus, emotions such as enthusiasm and alertness are indicators of high PA, while lethargy and sadness are characterized by low PA. So in one sentence - when someone uses expressions that indicate negative emotions, it is highly probable that this statement is negative and vice versa. The PANAS consists of 10 statements that relate to positive emotional states and 10 negative ones. This 20-unit questionnaire was invented by Messrs Watson, Clark and Tellegen in 1988. How does the trial period work in SentiOne and what features does it include? The functionalities that are not available within the trial period: PDF Reports, Instant Response from the tool, Data exports, Opinion Leaders, Social Reach. If you are interested it testing them - contact us directly. After the trial ends, the test account is blocked automatically, unless you pick a paid account. You can choose one of the plans here. If in doubt, contact us within on-site chat or by contact@sentione.com. We’ll be happy to help you choose the plan that truly suits your needs. Why do I see the results only in one language? Trial and Team plans have access to one monitoring language, set for the account during the account setup. If you wish to change the language or monitor more languages, please contact us directly at help@sentione.com. How can I set monitoring language for my project? Is my account supposed to be locked after the trial period? Yes. After 14 days of trial, the account is automatically blocked. When the trial expires, the system does not charge any additional fees. To keep your online data analysis, extend your account. Log in, choose a paid plan, and fill out the payment form. What is the difference between a project and a keyphrase/keyword? A project within SentiOne system is a set of rules and keywords for your online monitoring. Here’s an example to illustrate the difference between the project and keyphrase/keyword. Is signing an agreement mandatory to use SentiOne? Nope, there is no need of signing a cooperation agreement. The invoice system lets you pay for the service on a monthly basis. Can I change the plan during my subscription? Yes, subscription plan can be changed anytime. You can change it manually in the automatic payment form or use our help at contact@sentione.com. Can I purchase additional projects within my current plan? Yes. You can purchase additional projects at each plan. Just contact our customer service at help@sentione.com. Enterprise Plan is a custom plan that is crafted for each client individually. Therefore we are able to give specific pricing information after we learn your needs. If you are interested in an Enterprise account demonstration, please write us at contact@sentione.com. May I have access to more than one account in SentiOne? Yes. The system allows you to use multiple accounts. You can freely switch between them. To do so, select "Profile Settings" in the upper right corner after logging into SentiOne. What is the context of a mention? The context is an important text that is located in the close environment of a mention. In case of web pages context is usually e.g. page name, thread name, title of the article, article content, the content of the post commented on Facebook. In some cases the context may be also the name of the author. Is it possible to exclude certain domains from the list of monitored sources? Yes. 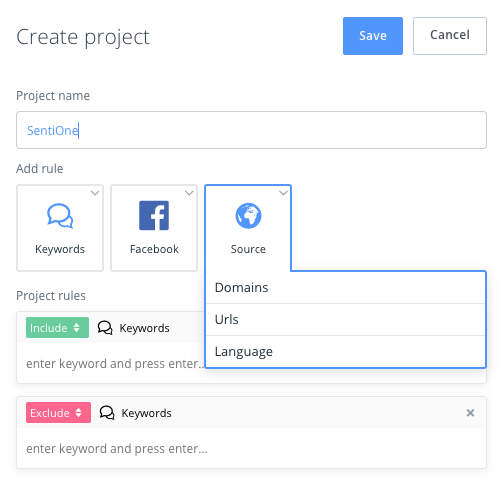 While creating a project in SentiOne, you can exclude chosen domains from the query configuration. To do so, enter the domain name in the box for excluded parameters. Is it possible to monitor the results only from the selected Fanpage? Yes. SentiOne allows you to collect mentions from the certain fanpage. 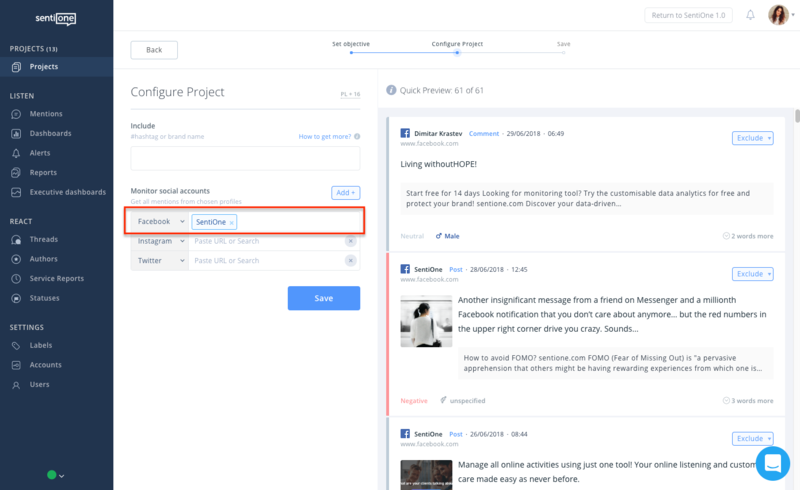 To do so, select the fanpage name and add it during the configuration within Social Profile scenario. For more advanced configurations (like excluding specific post types from your search), please contact our support. Everything is possible - and we are always happy help you find what you are looking for. Is it possible to monitor the results only from the selected domain? Yes. SentiOne allows you to monitor the results from the selected domain. Go to Advanced Project Configurator and during the setup enter the link to the main domain from which you wish to collect the results. Is it possible to receive automatic periodic reports from SentiOne? Yes. SentiOne allows you to configure periodic reports. Depending on your needs, they can be sent daily, weekly, or monthly. Can I add other users to my SentiOne account? Yes. You can add as many users as your current plan allows. To add another one, go to Users tab and click Create. Does SentiOne offer free accounts for bloggers? Yes. We offer free permanent accounts for bloggers. If you write a blog and want to use our social media listening solution, please write a bit about yourself and your blog to jagoda@sentione.pl. How can I be sure that SentiOne covers the websites that are most important for me? However, if you’ve found missing mentions from web or domain that we don’t crawl yet, you can send us the link or list of domains that are crucial for you. We will verify if our crawlers see all of them and provide the relevant information back to you as soon as possible. How does SentiOne calculate Reach? We use different reach estimation approach for different sites. For generic web pages, to estimate the reach, we use measurements of traffic for the domain provided by an external vendor. In order to estimate the reach for a specific statement, we combine statistics for the domain with information about the statement that we have gathered in our system. What we take into account as well is traffic on a domain, number of unique visits, lifetime of the content, vitality of a page (e.g. how often the page is updated), type of the content (comment, article, etc.) and other information. For internet forums, we use neural network algorithm that estimates the number of views based on characteristic of a thread and forum. For social media, we use either values given directly from a specific API (e.g. Youtube, authorized pages on Facebook), or estimation based on number of interactions with a post and followers (Instagram, Twitter, Google+). You can sort all mentions by reach anytime and check charts showing reach in time, rich summary in Analysis tab. Share of reach (estimation) - Ratio of cumulated estimated impressions for given topics in given time range. What does the Influence Score mean? Influence Score is calculated mainly based on mention’s reach. It helps you to discover statements, authors, and sites that are the most popular and influential. How many times a mention has been viewed, shared, or retweeted. What does the Brand Health Index mean? Basically, it is positive to negative mentions ratio. 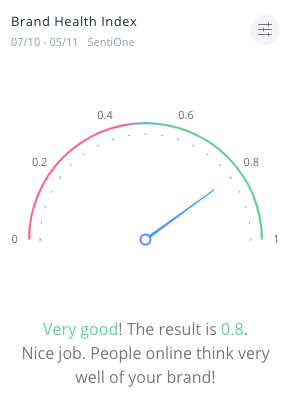 It tells you how your brand is perceived online, and so gives you simple information about the average internet user opinions. Is it possible to share the Analysis with my colleagues who don’t have the access to SentiOne? Yes. In SentiOne, you can create and share an Online Analysis using a dedicated link. Your colleagues, who don’t have the access to your panel, can watch trends and analyse the data gathered by SentiOne for your project. Online Analysis are refreshed automatically and shared as long as you keep the option open in the system. What does the Keyword cloud show? Keyword cloud shows words that are most frequently used in the context of your project. The bigger the word, the more often it appears in gathered mentions. This way you get insights on main topics around your project. For example, if you pick only positive statements in your brand monitoring, you can see what people liked about your brand, which campaigns were the most successful, or which influencer gets the most buzz. Can I export data from my SentiOne projects? Yes. In the Team plan, you can export the charts from Analysis in picture files (svg, jpg, png) and data files (xls, csv). In the Enterprise plan, you also have the opportunity to export all mentions as a spreadsheet (xls, csv) as well as all the details and metadata attached to each mention. Could you suggest a workflow for a qualitative analysis? Usually, when our clients wants a deeper understanding on a given topic, they do qualitative analysis on the data that our system gathered for them. The basic flow is first to analyse the charts one by one (answers questions like: what caused the biggest peaks, why there are so many negative mentions, which were the hottest positive and negative topics, who are the influencers and which were the most popular mentions). After this, you can start the qualitative part by reading and tagging (categorizing) the mentions (you can create your tags in left menu: Tags). After you’re ready with tagging, you can add more charts to your Analysis, e.g. Tags pie chart where you can see the ratio of each category. If you don’t have enough time to do it on your own, don’t hesitate to contact us. What kind of data do I see on Geolocation maps? On Geolocation map, you can see where the mention authors checked in while adding a post that got gathered within your project. For example, if someone shares a picture on Instagram and check in in some place like restaurant, hotel or town, our system will gather such information and visualize it on the map in your analysis. Why do I get less results in the preview than in Mentions view after saving my project? While creating your project, you can see a quick preview showcased instantly. After saving your project, the system redirects you to Mentions view where there are all the gathered mentions. Please note that the default time frame is “Last 30 days”. You can change it for the whole project in Mentions module or for each of the widgets in Analysis separately (this way you can compare one project in different times). Is it possible to monitor private Facebook profiles, groups, and events through SentiOne? Providing safe and legitimate data for our clients has always been one of the top priorities to SentiOne. That is why we never cross official channels to collect mentions, yet still we are praised by our clients for most accurate and vast monitoring. You should know that since April 30, 2015 it has not been possible to lawfully monitor private Facebook profiles. On February 6, 2018 Facebook made additional API changes, which moderately reduced the access to Facebook data. This means that outside companies are no longer able to collect data from groups and events. How does SentiOne collect data from Facebook, YouTube, Instagram, Twitter? In SentiOne, we use our proprietary algorithms to crawl and gather data that are publicly available. In case of social media platforms, we gather data through their official APIs. What is the difference between results that can be attached to a report: important, all, tagged? Tagged - only those results that were tagged in Mentions section. What happens if I ignore a mention in Mentions module? If you ignore a mention in Mentions section, it won’t appear in the results anymore. It won’t be seen among the results displayed in your analysis, nor in the reports for this project. This process is reversible: you can undo it in Mentions section. What is the difference between Keywords and Advanced Keywords in Advanced project configuration? The main difference is that the SentiOne system will read these two types of keywords differently. Simple Keywords include some basic rules by default, while Advanced Keywords need additional markers for more complicated queries. We recommend using Advanced Keywords when you have a very specific search in mind and know the basic Boolean operators (you can find more about it here). For example, typing two or more words in the Keyword box with spaces between them will result in obtaining statements including these words in that specific order. The same action performed in Advanced Keywords box will results in obtaining statements including these words in different parts of the statement, possibly in different order, unless you use quotation marks.